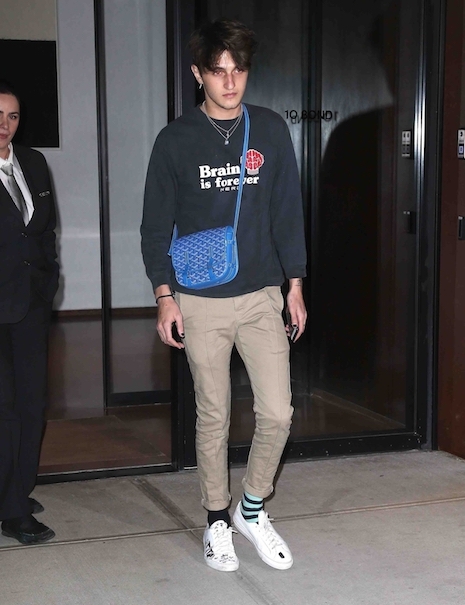 Curious that Anwar Hadid, 18, is still wearing that baby blue Goyard handbag, while his model sisters Gigi and Bella rarely carry a bag at all – only their phones! Anwar doesn’t hesitate to wear the bag to black tie or casual events, and doesn’t consider it a challenge to his masculinity. (Remember, he has a gorgeous girlfriend five years older than he is.) What we’d like to know is: what’s IN that bag. We wish some magazine like GQ would coax him into emptying his handbag and talking about the contents like female celebrities often do. Blac Chyna Posting About A Student Loan Forgiveness Scam? Paula Deen, We Don’t Want You Back!